Get a HUGE FREE SPECIAL BONUS (watch the video for this)..."
"Please Turn Up Your Speakers & Wait A Couple of Seconds for the Video To Play..."
If you're fed up with the time drain of planning for your scouting meetings or it's a real struggle researching and prepping so the children can achieve their badges, then the badge planners will save you weeks and weeks of prepping for meetings. Are You Anything Like I Used To Be? So Just Imagine If Someone Came Along & Did All This Work For You? What would it be like to have meeting after meeting all laid out so you didn't need to lift a finger? Plus imagine what it would be like to have endless 'easy to run' fun games and activities that held the boys interest the whole time they were with you! Well that's what you get when you use anyone of my proven planners to run your activity or challenge badge meetings. Literally everything has been done for you! There's no more spending hours of personal time burning the midnight oil learning, research and planning. There's no worries about cramming to get things done at the last minute. And you've got nothing to think about in terms of how to run the meeting because you've got a complete plan from the moment they walk in the hut until it´s time to go home. Plus things are all laid out using professional learning design techniques so anyone (and I mean anyone) can use anyone of these badge planners and run an activity or challenge badge meeting like a seasoned pro. If I take 'School Holidays' the 'Badge Planner Series', 'Occasion Packs' & 'The Baden Powell Back To Basics Membership Award Series' this will give you at least 2 1/2 - 3 Years of planning for each section. Gives you 3 WEEKS of meetings all laid out and DONE FOR YOU at the start of every NEW TERM! 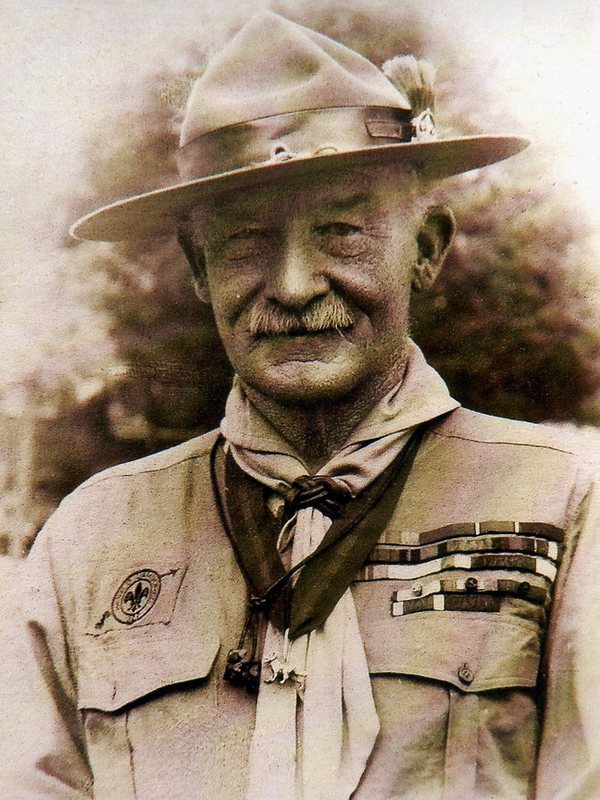 Once inside you’ll get access to the brand new BADEN POWELL BACK TO BASICS SERIES. ‘Back to Basics’ gives you 12 modules that make your meetings run more smoothly by allowing you to grab control of things, increase attention and improve behaviour of the group. Plus it helps you take the kids through the membership award at relevant times during the year. To start with there’s a StartRight, RunRight and Endright formula module which gives you some easy to use systems that ensure outside influences don’t drag your meetings off track such as parents needing to ask questions or late arrivals. This module also includes some very powerful techniques which heighten attention and increase a childs motivation to complete tasks and they’re based on common sense… so they’re really easy to use. Plus… ‘Back to Basics’ has been designed so you can communicate the purpose of things and the reason certain things exist in scouting at every meeting rather than at the odd investiture ceremony. This helps you avoid losing the goodness of those principles through the year and makes sure your group meetings are much more than just a weekly get together. A database of OVER 50 games that allows you to fill a gap in any of your meetings at the last minute! This is a brand new ‘LAST MINUTE GAMES’ area I’ve developed for you right inside your members area with over 50 games included on launch. This will be increased each and every month so you’ll never be short of games to pick from if you need to fill a gap in any of your meetings at the last minute. Plus you’ll be able to filter on things like whether it’s an inside or outside game, whether it’s an action or calming down game and if the game needs equipment or not. I have to say this is a great asset that you now get free as part of your membership. I think you'll find this bonus hugely valuable. Over the years that I've been running my Facebook page other leaders have run into some real life challenges that to say the least haven't been easy to deal with. So what I've done is start to compile them in a new area within the membership site along with the practical ways in which they were resolved. This will grow over time into a trusted and valuable area for all members. This is a Useful Forms and Documents area I've built for you. This will be added to each and every month and to begin with will include a Parent Welcome Pack, Risk Assessment Form and 'How to Use Parents As A Guest Speaker' guide. This is something that I’m very very excited about and that I know every single leader that has used my material will love too. This bonus is the NEW camping series that launched in January this year and by joining the EasierScouting Membership you’ll get this amazing series COMPLETELY FREE with your membership. This will be a separate chargeable product priced at £39.99 pa. soon. The camping series includes games and activities around specific themes you’ll be able to apply right outside the group hut or on trips you take with the group. Trust me it’s worth getting your 'Make Life Easier' members pass just for this bonus! If you've already got the planners and access them from the old area you'll live this bonus! This is a great bonus for anyone that already has my badge planners and occasion packs. When you sign up for ‘The Baden Powell Back To Basics Series’, all of your badge planners and occasion activity packs are included within the new membership area so you’ll have everything in one place and these will continue to be added to year on year. 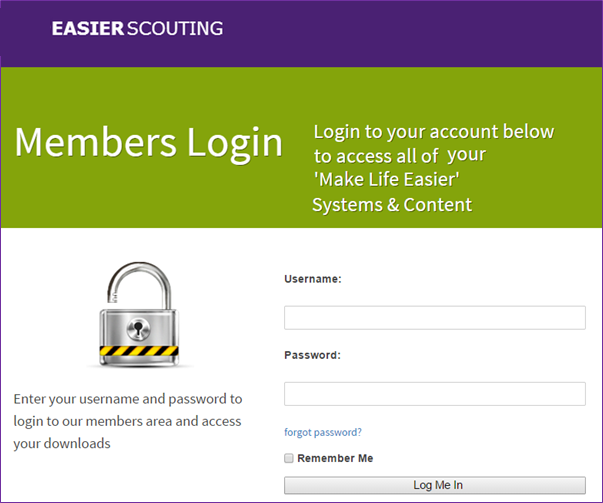 Access all of your EasierScouting.com resources anytime, anywhere and ON ANY DEVICE... including iPad, Kindle, Smart Phone and iPhone! brand new state of the art membership site which makes everything a breeze when it comes to accessing all the content. Plus it works on all your mobile devices including smart phones so you can get to anything wherever you are, whenever you want… even if you’ve forgotten something and you’re in the middle of a meeting with the children. And if you’ve ever forget your login details don’t worry. The whole site comes with automated password and username reset functionality so you’ll be able to log back in with just a few simple steps. 2. Click on the relevant 'Buy Now' button and you'll be taken to a Paypal page where you can either use your Paypal account or click on 'Other Options' and use a credit card. All packages include ongoing updates to: new badge planners; new occasion packs; new games & activities for the back to basics series; new camping planners, new leader experiences; new forms or documents. … I’ll give you a complete refund on the spot! Disclaimer: Even though I have been a Scouting leader and all of my work has been designed to make life easier for my Scouting leader customers, I would like to make it clear I am an independent service and not controlled or managed by The Scout Association. However, all Scout elements are used by permission of The Scout Association. Please note all testimonials are completely authentic. Gareth Lloyd-Tolman, Scout Leader, Torfaen District Scouts - The planners are unbelievable, they're so packed with information and activities that I can't wait to start running the Meteorologist Badge after half term. Sue Haran, BSL, 3rd Teddington Scout Group - Been a Beaver Scout Leader for last 20+ Years and got a feeling that since purchasing Samantha's Planners the next 20+ will be made even easier. They are all Fab and Well Thought Out and practically everything is done for you. As not only Beaver Scout Leader but a working Full Time Mum and Nan as well think I may just be getting a 'little bit' of time to myself now. Cheryl Stonebridge, Cub Leader, 4th South Lambeth - Sam... fantastic. Started Communicator last night and not a whinge or whine from any of the 36 cubs. No demands for dodgeball, must be the first time in 4 years! Looking forward to trying out the rest. Lynn Newins, Cub Scout Leader - Thank you so much for the planners. I can highly recommend them they are going to save me so much time and effort now. Definitely something I could have done with a year ago! Charlotte Pattle, Beaver Scout Leader - I have received the Beaver Imagination Badge Planner today and wanted to say how fab the pack looks. It is full of tips and ideas and complete meeting plans. I can't wait to complete the items with the boys - especially the play! (We can invite the parents to watch and charge money for tea and coffee as a small fundraiser) Would definitely recommend to other Beaver Leaders - buy it now! Ian Jones, Beaver Scout Leader - I've been so pleased with what I have purchased from you so far I'd love to buy the Badge Planners for Beavers. Keep me informed of your new planners as they are released please. Carol Scott, Cub Scout Leader - I have looked through just a few of the planners that I have bought and I love it so much, you have got no idea how much time this has just saved me. I am a few leaders short this term and I needed something like this so I commend you on your hard work - thanx a HUGE ton! Beverley Martin, Cub Scout Leader - Fantastic. Such a time save. Very happy. Michelle Stephens, Cub Scout Leader - Once again excellent breakdown of badges with lots of useful time saving ideas. Your information takes all the hard work out of planning cub meetings. Can't wait for you next one. Many thanks from "A less stressed cub leader"
Gill, Cub Scout Leader - I can't tell you how much you've helped me. I'm currently reviving a group that's been dormant for over 10 years. I've managed to get a full cub pack going now but I'm the only leader. I have 2 pack assistants who are great with the cubs but don't want to get involved in planning so you can imagine how hard it is keeping up with everything else and doing the planning on my own. Janine Pledger, Cub Leader - Programs that I have received are fantastic-not normally a badge that I have done before, as too complicated-but with your planning, seems so much easier. Raymond Wicks, Cub Scout Leader - What can I say, you're a Saint!! They are absolutely brilliant and will save me a lot of sleepless nights. I'll be back with the next day or so for some of your other planners, I only wish that I'd found them sooner. As for your service it's second to none. Karen Carter, Beaver Scout Leader - I was a Cub Leader for three years but I had to give up due to health problems. After a break of nearly two years I have now returned to Scouting this time as a Beaver Leader. As a Cub Leader I used to spend hours doing programmes similar to yours however due to other commitments I don't have the time I used to have. Your plans will make my job as a lone leader so much easier and less time consuming. I can't wait to use them in the New Year and I am sure my Colony will enjoy achieving their badges. All I can say is please keep the planners coming. Joanne Ashford, Cub Leader - I love it !. Anything to make planning a meeting easier in my book is a good thing. If you have any more brilliant games and ideas you are welcome to e-mail me. Pauline Mycock, Beaver Scout Leader - Hi Sam Just thought you may like to know how good your safety Badge work is. My colony thoroughly enjoyed doing it and now have all gained their safety activity badge. Joanne, Cub Scout Leader - These are way better than I had planned to do! You are a star as always! Carol Wheatley, Cub Scout Leader - Thank you ever so much Sam, this has cut a lot of my time down. 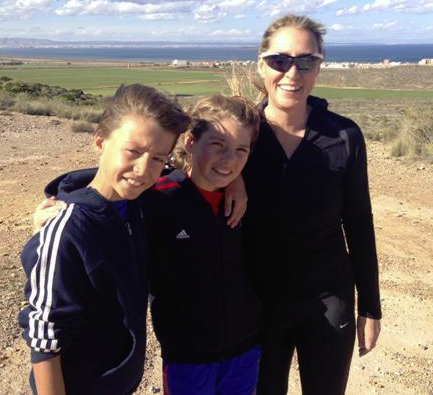 May Pacoe, Cub Scout Leader - Just to let you know I think your stuff is great – it has saved me loads of time. Julie Lund, Cub Leader - I have your astronomy pack which was great fun. Judith Bush, Cub Scout Leader - Yes I have used Home Safety, Personal safety and your Communicator planners and they are very good. I am interested in purchasing your new kits. Simon Cook, Cub Scout Leader - We are currently using your astronomer badge resources and our cubs are having a great time. Ian Jones, Cub Scout Leader - Still using your planners - what a Godsend! Sam Baron-Richardson, Scout Leader - OMG Samantha you are a genius, thank you so much for all your hard work, you really do make my life so much easier. Steve Burroughs 23rd Croydon - Really rely on your planners, they are so helpful and easy to implement into my programme I'm lost without them! Leanne Conway-Wilcox - 1st Westershope - Your site is a lifesaver!!! Janet Swift, Cub and Scout Leader - 27th Northampton Parklands - The best thing you could ever and I mean EVER spend your money on saves time and money what more could you want!!! Jenni, Cub Leader - Goodyer "They pay for themselves I promise and these Occasion packs are amazing!" “Sam, You And Your Planners Are Priceless. Not Only Are They Ideal When You're Planning An Evening To Help Make Everything Run Smoothly, Keep The Youngsters Focused And Help The Leaders To Not Go Mad But They Are To The Point, And We Always Know What We Have To Do And Don't Get 'Lost' In The Instructions Because They Are Short, Sharp And To The Point. This Ensures The Leaders Enjoy The Evening Just As Much As The Kids Do. Ken - Baloo 3rd Davyhulme Cub leader - I find it so easy to use and to put together why the whole of scouts don't use it is beyond me, I am about to launch and lead the Chinese New Year this year and are planning to do so really cool stuff and with what their is on here is really going to help me, so again thank you so much. I've put together the complete package of 'make life easier' assets and activities for anyone who runs a scouting group. I was going to sell them individually...but then decided to bundle them as the ultimate companion to the Badge Planners and Occassion Activity Packs. So what's included, what's the deal? Just read everything on this page. PLUS... the NEW CAMPING SERIES will be given away as a FREE BONUS to the first 100 leaders that sign up (watch the video at the top of the page to find out more).